This VoIP phone has multiple backlit programmable buttons, dual color IP lines, and tons of features to help the user customize his/her experience. Everything in the picture is included. The Yealink SIP-T23G hosts a multitude of features while remaining intuitive to the user. Taking the hassle out of using your phone, the T23G allows users to remain productive, engaged, and in constant communication with the rest of their organization. HD Audio makes calls sound as if the conversation is taking place in person, with the clearest audio technology available. 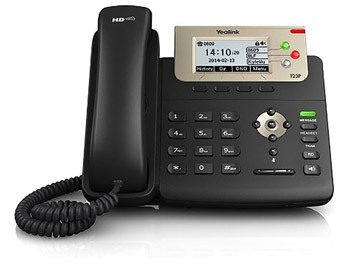 Not only is the Yealink SIP-T23G an ultra-clear sounding phone, it boasts a myriad of features to users, including enhanced call management, hold, mute, DND, group listening, phonebook with up to 1,000 entries, and much more. Read below to learn all of the key features, and a list of included features. The hardware incorporated in the SIP-T23G combined with the technology included in its software provides the best sound quality available to VoIP phone systems. Your old phone couldn’t do anything while you were in the middle of a call. But with the SIP-T23G, controlling the functionality of the phone call is at your fingertips. Staying in touch with your fellow coworkers has never been easier. Make announcements on the intercom, page the colleague you need to speak with, and stay on top of things. Security is always paramount. Lock your phone with your personal passcode so that no one can access your phone system. Your information is stored safely.